As part of a long-planned effort to calm traffic and improve pedestrian safety on the eastern side of Bernal Hill, the San Francisco Municipal Transportation Agency (SFMTA) is preparing to install new stop signs on Bernal Heights Boulevard, near the Vista Pointe Garden mini-park. The signs may be installed this week. In 2015 staff at the SFMTA legislated three stop signs and one additional crosswalk at the intersection of Bernal Heights Blvd and Carver Street. The intersection will be an all-way stop controlled intersection, and two curb bulbs will be constructed to shorten the crossing distance for pedestrians. The new crosswalk will be installed across the southbound approach of Bernal Heights Blvd, west of Bradford Street and north of Carver Street. The other existing crosswalk will be striped with high visibility crossing treatments. We had been waiting to install the stop signs until after the curb bulb construction since the signs will ultimately be located on the curb bulbs. However we can install them in the short-term and move them once the bulbs are constructed. In an update, SFMTA’s Golier adds that the new stop signs may be installed as soon as Tuesday, Aug. 22. Bernal Heights is built on the slopes of a hill, and our neighborhood is home to several of the steepest streets in the City. So it should come as no surprise to anyone, really, that runaway cars and trucks are a very real danger here. Last Friday, a runaway truck caused some havoc on Treat Street just south of Precita Park. Thankfully, no one was hurt, and property damage was minimal, but it could have been much, much worse. Just another afternoon on the steep incline of the 1500 block of Treat Ave. The truck missed our house by 24″. The tree was the only thing that stopped it; Otherwise we would have had a living-room filled with other people’s Amazon diapers and music. Afterward, the block was filled with stories of past runaways. Somehow this truck without brakes threaded the needle between Eddy the dog, a neighbor’s steps, and her car, missing all, and came to rest in the poor tree. Residents of northwest Bernal are familiar with the hand-painted Honda that’s often parked near the Coso Triangle; the car is a conspicuous landmark that celebrates our local sports teams, fandom, and San Francisco itself. You might consider purchasing this vehicle as a daily driver. Or, after a proper buffing and polishing, it would also be rather exquisite on display under tasteful lighting at your favorite folk art, automotive, or sports memorabilia museum. Your choice. UPDATE: June 24, 2017 Price cut! 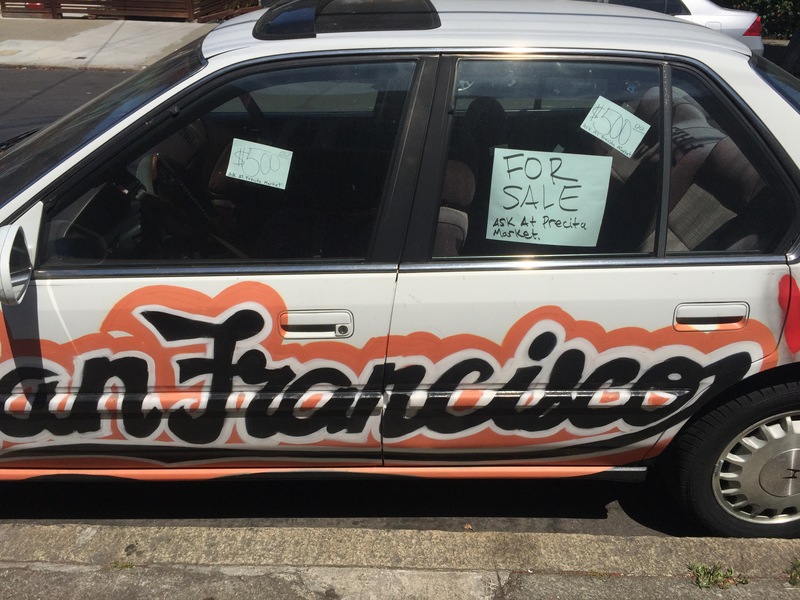 According to the signs on the window, the most San Francisco car in San Francisco can now be had for the LeMons-friendly price of just $500. What a value! Closed course. Non-union driver. Do not attempt in Bernal Heights. Those fuel-huffing fathers from Bernal Dads Racing are pleased to announce that as part of their effort to move Muni Forward, Bus 670 will offer 24-hour super-express transit service on a trial basis this weekend, from 11 am on Saturday, March 25 until 11 am Sunday, March 26. As every SFMTA enthusiast knows, the Muni Forward program is about making it easier and safer to move around San Francisco. Based on feedback from San Francisco transit riders, the Bernal Dads have taken it upon themselves to explore the possibility of providing faster, more convenient, and more reliable super-express Muni service anytime, day or night. With those modifications complete, Bus 670 will head to Buttonwillow Raceway Park this weekend to study the feasibility of uninterrupted super-express Muni service by participating in the Lucky Dog Racing League’s “Doggone 24” competition, a continuous, 24-hour endurance race that will provide a realistic simulation of extended-duration rapid transit operation, driver fatigue-management, and intense maneuvering in wheel-to-wheel San Francisco traffic. “This Muni Forward infrastructure improvement was funded entirely with loose change the Bernal Dads found beneath the cushions of our sofas, with no support whatsoever from Prop A, the bond measure passed by San Francisco voters in 2014. We have listened to Muni riders and look forward to reducing travel times and increasing high-speed service in a rapidly growing city,” said Neighbor Brandon Powell, Bernal Dads Racing’s Director of Advanced Projects. To monitor this important public transit experiment and get regular NextMuni updates on lap times and anticipated service intervals, aspiring passengers are encouraged to visit Bernal Dads Racing on Facebook throughout the weekend. And as always, thank you for riding Muni. Well it’s obvious why you chose my car. Two-toned duck-tape holding up my passenger side mirror, on an old beat-up 2003 Nissan. Absolutely nothing inside but a few cassette tapes which you rummaged through and didn’t seem to appreciate. You stole nothing, but you left me a new umbrella. Thanks kindly. Neighbors beware. My car was parked on Anderson near jarboe. Looks like the perpetrators were looking for money, any technology, &/or a garage door opener.